Loving husband of 56 years of Sharon (nee Marshall). Devoted father of Bill, Diane, Bob (Judy), and Michelle (Michael) Roberts. Cherished grandfather of Claire, Benjamin, Madeline, Allison, and Quinn. Dear brother of Marilyn (late Richard) Uren, Kathy (late Doug) Hauser, late Jack (late Helen), and the late Don Vonderheide. Loving son of the late Ann Vonderheide (nee Bradshaw). Proud uncle of many nieces and nephews. 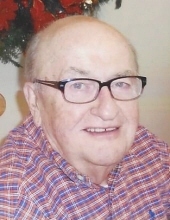 Funeral Monday 10:30 a.m. from the Robert J. Sheehy & Sons Funeral Home, 9000 W. 151st Street, Orland Park, IL to St. Julie Billiart Church, Mass 11:15 a.m.
Funeral home opens at 8:00 a.m. on Monday. Procession leaves the funeral home at 10:30 a.m. on Monday to go to the church. "Email Address" would like to share the life celebration of William J. Vonderheide. Click on the "link" to go to share a favorite memory or leave a condolence message for the family.